I don't understand the variance command. I understand that it's a multiplier, so a variance of 10 would take your advertised distance of 100 up to 1,000. Right? The part I don't get is how do you use it to force unequal load balancing. Is the goal to pick a variance number that makes the desired alternate path equal to the path that is favored? So I'd have to place the variance on the router with the low bandwidth? The variance command only works based off the best metric found to the destination. If you' have 4 routers to a destination all in the same AS. They will choose which of those routers has the best metric. 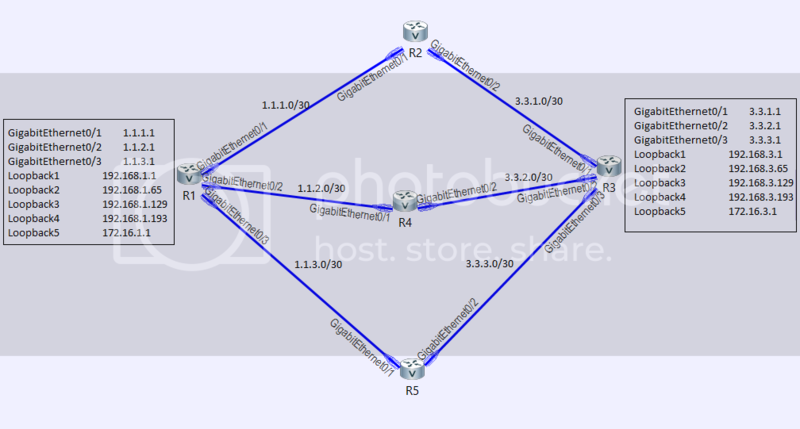 Implementing the variance command on the router that is connected to the 4 routers will allow that router to see the best metric then multiply it by the variance. This let's for example, will allow it do unequal cost load balancing between 2 or 3 those routers. So it's not about placing the variance on the router with the lower bandwidth, but on the router that sees the multiple paths to the destination but has only decided to use the best path there. All the links are equal cost so all routes make it to the table. I want to bring that gig 0/1 route back into the routing table using the Variance command. How do I know what Variance number to pick? I tried everything from 10 to 128 and nothing would bring the route via 1.1.1.2 back. I know the answer is simple but I just can't get my head around this Variance concept. OK so I think I've got half of it. The reason that the 1.1.1.2 route never came back is because it's RD is not less than my FD. This means it was never a Feasible successor. In order for it to be a Feasible Successor R2 has to have a path to R3 that is faster than my path to R3. This is one of the concept I was struggling with. Alright, with that cleared up I have to manipulate all the paths so that R2 is a Feasible successor. This way I can see the variance command in action. OK so I think I've got half of it. The reason that the 1.1.1.2 route never came back is because it's RD is not less than my FD. This called the Feasibility Condition. If it can't be a Feasible Successor then it's considered a loop. The variance command multiplies the best path (lowest cost). By raising this number the other paths look better and are included in the routing table. So if the best path has a cost of 10 and the feasible successors have a cost of 15 and 18, then a variance of 2 will bring the best path up to a cost of 20. Because 15 and 18 < 20 those paths are included in the routing table. So the variance number you want to use is a number that brings your FD high enough to allow the Feasible successors you want to use be included.